So now that I finally got the swim out of the way, I started bike shopping last October. I wasn't sure if I wanted a tri bike or a road bike. All I had ever ridden before was a mountain bike. I started researching bikes and found a lot of great information on beginnertriathlete.com. I started hanging around the forum more and logging my workouts there. If you are looking for good info, check it out. Anyway, I went to several bike stores and received many different opinions. Go with the Gary Fisher because it has a cool paint job. Go with the Trek 2.1 because it has a compact crank. 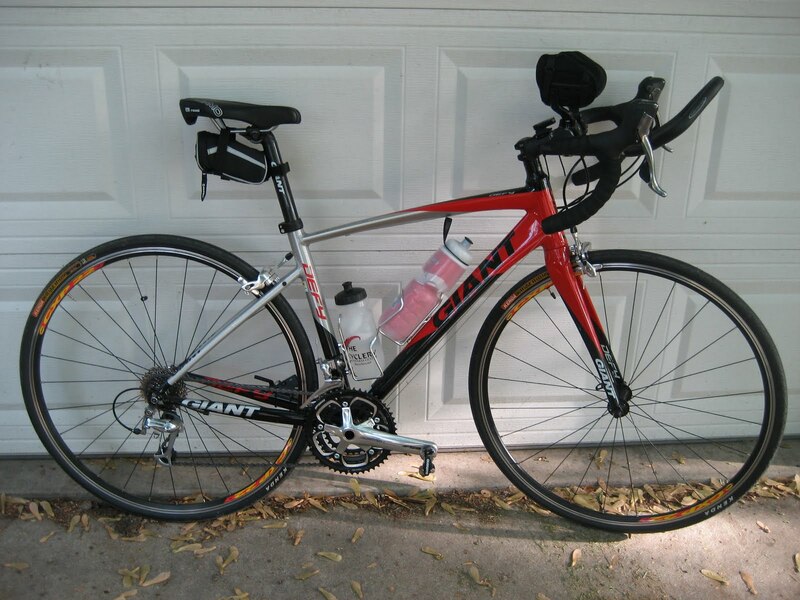 Don;t go with a tri bike because it is less stable and a much harsher ride. People that tell you that a tri bike has a harsher ride don't know what they are talking about, it has more to do with the wheels and frame material than the geometry. Go with a low end Cannondale, it's a good beginner bike. It went on and on. When I asked some people about getting a bike fit, some looked at me and said, you need this size while others new what I meant and described their fit process. In the end, I decided on a road bike with aero bars. That way I can ditch the aero bars and ride with the local bike club, and if I don't stick with triathlons, I can ride a road bike for exercise. I also had a limited budget and decent tri bikes started outside my range. I am stashing $20 in an envelope here and there to start a tri bike fund. Maybe I'll find a decent used one in a year or two. I ended up buying a Giant Defy 1 just after New Year's. To save money I have spd pedals on so I can use my mountain bike shoes for now. I picked up a Cyclops trainer on Craig's list and I was ready to add biking to the list. I road it for about 30 minutes two days in a row and had some extremely painful issues. After a couple (make that four) trips to various doctor's everything checked out ok so I bought a new seat. 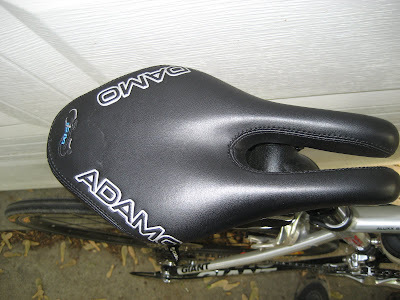 I bought an Adamo road saddle and my problems were solved. The seat looks funny, but it feels great. So with the bike under control, I started upping my mileage every month, signed up for the St. Louis 1/2 mary in April, and my first three tris. Effingham, IL on May 16, Carlyle, IL on May 23, and Innsbrooke, MO on June 26th. I'll be middle of the pack, but I'm pumped to be two and a half weeks from my first tri. It's been a fun journey so far.